5 Large water bird with blueish-black feathers, patches of white on neck and red head and beak. Seen in the south west of England on a large pond. It's half way between a mallard and a Canada goose in size. 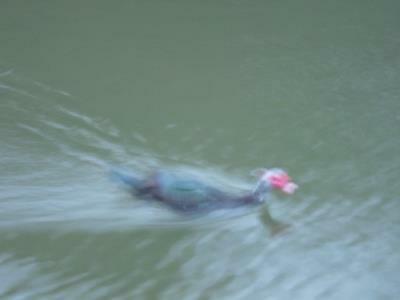 Sorry about the blurry photo - it looks like a Loch Ness Monster picture! 1697 Apologies to Chrisofbristol for the photo upload problems, they are being investigated - meanwhile his photo has been manually added to the original post. 5 See new post Not A Blueish-black Water Bird, But A Black And Green One. for photos and an update.